The anterior longitudinal ligament is a strong band located anterior to the vertebral bodies and discs. Along with bodies of remaining cervical vertebrae it expands anterior towards the anterior arch of atlas. It includes long and short fibres and is a strong ligament. 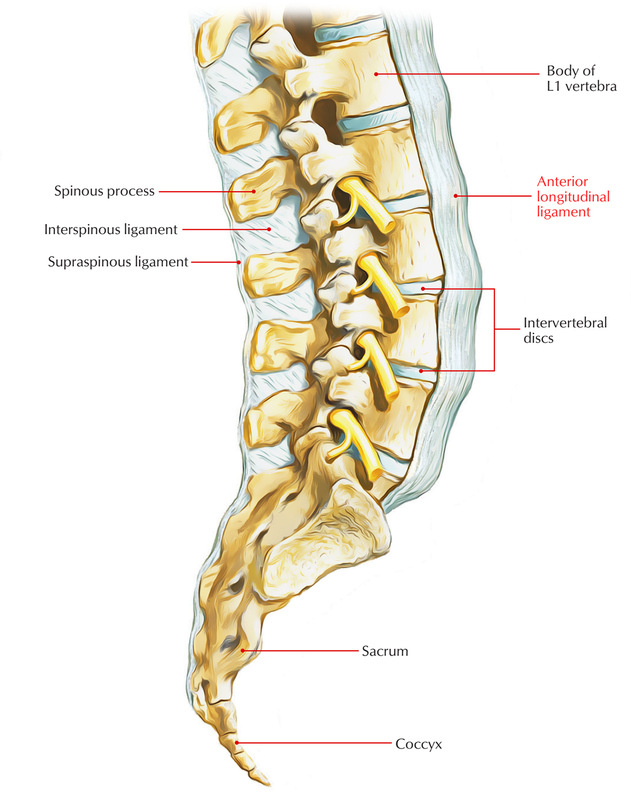 The long fibres link over several vertebrae while short fibres are deep and link through a single pair of vertebrae and are superficial, and merge together with the annulus fibrous of the intervertebral disc. It is strongly connected to the discs and is inserted within the periosteal sheath of the vertebral bodies. Inferiorly the anterior longitudinal ligament is constant with the anteromedial part of the sacroiliac joint capsule. Both crura of the diaphragm connect over the anterior longitudinal ligament within the upper lumbar spine, and some fibres expand in the ligament inside the lower lumbar area. Its longitudinal fibres have numerous layers – the deeper, shorter fibres connecting adjacent vertebrae, and the more superficial layers crossing 2-4 vertebrae. Age-related changes develop within the anterior longitudinal ligament so that it loses its elastic traits and energy dissipation characteristics. The density of the bone in which the ligament connects also reduces. As the mineral content of the bone lowers with age there is also a lack of strength of the ligament. The main role of the ligament is to avoid anterior separation of the vertebral bodies at the time of extension. It also helps to balance the lumbar lordosis. Forward and backward gliding of the vertebrae is avoided mainly by the annulus fibrosus, while the anterior longitudinal ligament also inhibits movement. The anterior longitudinal ligament is highly susceptible towards injury during rotation.